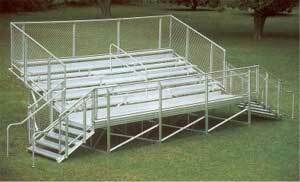 Our 5 row elevated aluminum bleacher systems allows for convenient spectator access to all tiers with an aisle. Not only does the elevation allow spectators to have a superior view, but are they are manufactured with high-quality anodized aluminum helping it function and endure the weather for many years. 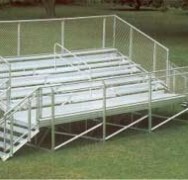 All our bleachers meet international building code requirements; we build bleachers for safety. The seating can vary depending on lenth of bleacher ordered. Seating capacity ranges from 54-94.